Financial independence is all about optimizing your income and your expenses. About balancing wants and needs. About finding a happy medium between saving as much as possible and maximising your life enjoyment. Even though that’s clear to most of us, some unnecessary consumption is unavoidable. What about expensive hobbies, for example? Everyone enjoys a hobby or two, so it’s only natural that they invoke expenses. If you’re a reader of this blog, there’s a high chance that one of your hobbies relates to personal finance or dividend growth investing. While those are relatively cheap pastimes to pursue, many other hobbies require a lot more capital to enjoy them to the fullest. But where to draw the line between overspending on hobbies and keeping your savings rate up? 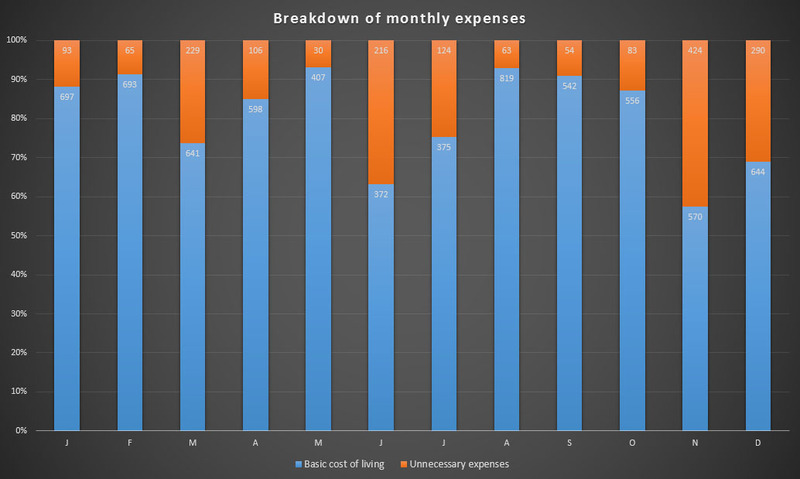 If we take a quick peek at my expenses from the past twelve months, for example, you’ll see that on average 20% of my total expenditure consists of nonessential spending. That’s quite a lot, all things considered! Because my savings rate hovers around 70% during the same time frame, I could easily boost it higher by as much as 6% simply by cutting out all frivolous expenses. It’s interesting to see that I splurge once in a while. March, June, November and December are exceptionally high, mainly due to short holiday trips. November’s unnecessary expenses were furthermore boosted by the new graphics card I bought for my computer, arguably my favourite pastime. Of course, these numbers are skewed heavily towards unnecessary spending because I’ve managed to reduce my basic cost of living to a minimum. Since I’m car-free I save about €400 every month, which translates to a 10% increase of my nonessential spending vis-a-vis basic costs, for example. The graph below illustrates this point beautifully as it also includes my savings rate. 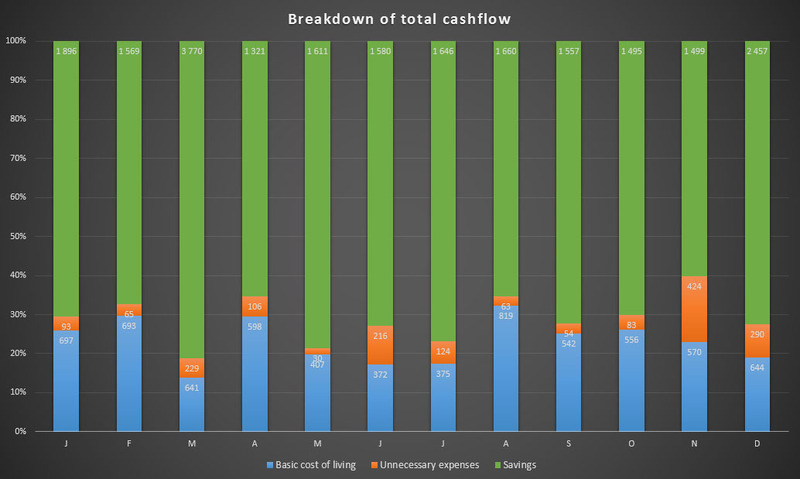 Now the unnecessary expenses drop to only 7% on average of my total cashflow. That’s not much even though I have some rather expensive pastimes and hobbies, at least in my book. For example, I’m currently typing this blog post on a PC worth a little over €3,000. Spending that much on a computer might seem ridiculous to many of you, but it’s not that much money at all when you take into account the countless hours of fun I’ve had with the thing; and what’s more, I even use it to make money on the side. 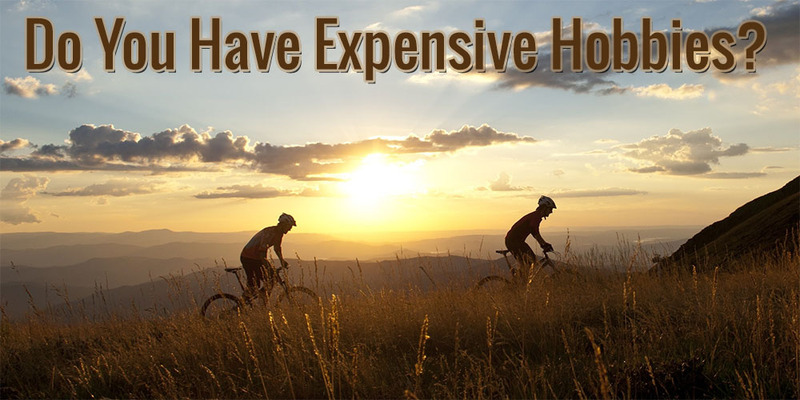 It’s a one-time expense – plus the usual upgrades every once in a while – that gives you enjoyment for a very long time, just like the mountain bike I bought a couple of years back. Even though the bike was rather expensive, especially at that time for me, I use the thing so often that it was worth every penny. And going out for a quick ride doesn’t cost me anything as long as there are freely accessible woods nearby. Over the years I’ve had other expensive hobbies though. As some of you may know, I enjoy collecting classic Nintendo video games. Such a hobby brings recurring expenses with it since you’ll have to dig through your wallet every time you buy a new game. That’s why I’ve currently put collecting on hold. It’s not that I can’t justify the costs, but I’d rather spend my money elsewhere or not spend it at all. 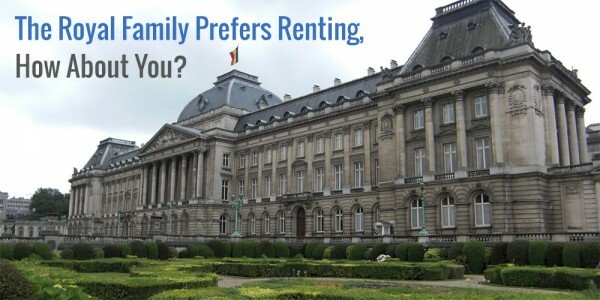 There’s clearly room to pursue that hobby, so why not spend the money anyway? This harkens back to what I said in the first paragraph and to something that many people forget. Financial independence isn’t about saving as much as possible per se; rather its aim is to balance wants and needs in order to maximise your happiness. Adding another rare Super Nintendo game to the collection and the rush that comes with acquiring it doesn’t even come close to the feeling of freedom you get when pedalling through the forest at 30km/h, at least for me. That’s why I’d rather splurge on a new and much more expensive bike than a classic video game. As you can see, not all optional expenses are equal! The feeling of wanting something is a continuum. On one end you have your ridiculous wants like a brand-new Ferrari or a twelve bedroom mansion, while the opposite side is home to those wants that are close to your basic needs and are, as such, almost needs themselves. I’ve said before that my only rule for financial freedom is to never, ever say no to drinks with friends. Even though this is clearly a want – I won’t die without those drinks – to me it feels like an absolute necessity to optimally and fully enjoy my life. And even with such avoidable expenses I’m still living the life, as Weenie recently put it in a comment to my March savings rate. And as you can see from the graphs up top I’m still putting a way a very large percentage of my paycheck, completely free of any loss of life enjoyment. A frugal lifestyle clearly doesn’t mean you should become a hermit. Make sure you have your financial priorities straight, but don’t forget to live a little! I agree with you entirely. Financial independence is supposed to bring happiness and enjoyment. Hobbies bring happiness and enjoyment. So why put them in suspended animation until FI has been achieved? 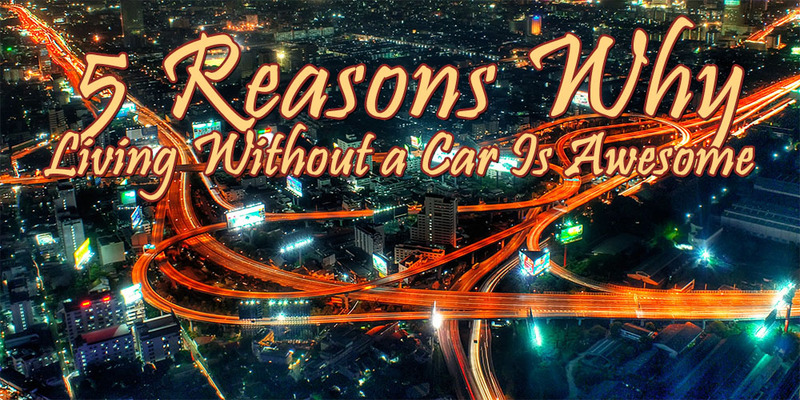 There is no reason. But that does not mean being unthinking about the process of where your enjoyment/value money goes. The key thing, as you point out is where you cut back. You cut back where the enjoyment is not as well offset by the cost (in time and money). It is that simple really. Nice post. Thanks for putting it together for us. You’re absolutely right that financial independence is about maximising your happiness and enjoyment. Living like a social paria but saving a ton of money won’t be enjoyable to anyone, so why do it if it only gets you to your early retirement a couple of months earlier? There’s no reason. Besides, if you don’t take into account your hobies related expenses during your accumulation phase, you’ll be surprised to find you won’t be able to enjoy any hobbies during early retirement anyway. 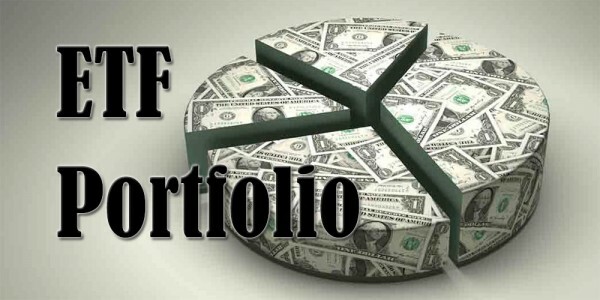 Dividend Growth Investing is by far the most expensive hobby I have ever had. I have literally thrown thousands of dollars at it and probably will continue throwing thousands per month in the future. With the saving rate you have, you can afford some extras, like tuning you PC. The only hobby we have is some round of golf for me and some discounted shopping from my wife. You get the good courses I hope, that’s why she gets the discounted shopping! Ha! There’s no reason to get the orange bar higher as I’m already living it up. Fun shouldn’t be expensive and most of my hobbies aren’t, apart from one-time expenses like computer stuff. Ha, the discount shopping made me laugh! That’s a great hobby to have for someone who likes shopping but wants to live as frugal as possible. And playing a round of gold won’t break your bank either, so keep enjoying it! It might even save you some health-related expenses in the future because you keep active. Thanks for the mention – you have clearly got the balance right, enjoying your hobbies and social life as well as achieving awesome savings rates. Even if you were to find a new hobby that ate into your expenses (oh you did, your dancing! 🙂 ), as you are saving so much, there is very little impact. I understand where you’re coming from with the expensive PC – mine’s not as expensive (bought it for £1k about 4 years ago) but the hours of enjoyment I have and have had from gaming (and now blogging!) have been worth it! By far my most expensive hobby at the moment is my gym membership but I make regular use of it and meet my friends there too so it’s fills a social need as well as a health need. My social outings too can make a big dent in my bank balance but like you, I don’t say ‘no’ to these – I would hate to achieve FI, only to find that I no longer have any friends to spend all my free time with! Anyway, great advice – YOLO isn’t right but we all do need to live a little! The dancing is actually quite expensive, but it’s a lot of fun and you get to meet a lot of new people. Totally worth it! And the best part is that I won’t need the classes anymore after a while. You and I share the same great mindset: spending money on social occasions is a good thing when it enhances your life and life enjoyment. If you spend because it feels like a social obligation then you’re doing something wrong. Your gym membership clearly falls within the first category. As for the PC, I agree 100%! I think the barrier to higher savings rates and financial independence is partly due to people’s expensive hobbies, e.g. shopping for clothes. As John Kingham from UKVI said once, ‘the problem with consumer-based capitalism is that it leads to consuming for pleasure rather than creating for pleasure’. If we could have hobbies that were creative, it would bring greater benefits to both ourselves and society e.g. we grow a lot of our own food. This means exercise in the allotment and garden, no food miles and transport for the product, and healthy organic vegetables for our bodies. Also, I’ve never really understood how shopping for clothes could constitute a hobby, but I can imagine how it’s easy to overspend when the goal of your hobby is to buy stuff. Couldn’t agree more. I spend a bit on cycling (even just the gear can be expensive, let alone the bike and services) but I love it. Not much comes close to hammering down a descent at near 50mph! I’m sure I could save more, but at the absolute maximum savings rate (expenses are the essentials only) I would just be sat staring out the window miserable. There’s a balance to be found for sure, cutting out all the excess consumption while still enjoying yourself! The sunk costs of a hobby like cycling can be huge in the beginning, but over time it becomes a relatively cheap hobby. You’ll have to maintain your bike, replace a lever or gear here and there, but overall the bike remains in good condition for at least five years. And you’re absolutely right, I wouldn’t trade the feeling of driving around in the woods for any amount of money. Good post, think you hit the nail right on the head. As per my post on motorcycles and expenses, I think I’ve just finished my most expensive hobby (for now). I may pick it up later in life with a Lotus Elise or Super Seven, as I’m still very much a petrol-head at hart. Sorry, but I do have to nit-pick a bit, I don’t agree with the term “unnecessary” in your post. It may be “non-essential”, but necessary it certainly is. As you noted, you want to enjoy a good life and don’t become a hermit. These expenses make this possible and are even (partially) needed for that matter. In my opinion unnecessary is when you spend money on a commuter vehicle when you can bicycle to work, for example. Rant over. Don’t worry about the nitpicking, I understand what you mean. I probably used the word unnecessary too easily as a synonym for non-essential. In essence, I mean expenses that you don’t need to cover your most basic needs in life. I hope you’re not in a hurry, it may take a while. But I can certainly drop you a note! I paid extra $45 for insurance so I can coach soccer for free. Mr is higher up in the company, so each time he gets invited to a company party, or event, I feel like I have to spend extra. Like, we will play golf at the company benefit event $100/pop instead of $30 golf fee if we would have play normally (sometimes I could get the green fee with card for $15/person) but it is still outrageous. Not to mention, might as well go for $600 set of Nike for him, and Taylormade for me. 🙂 it would be some of the thing that we’d splurge on. I figure golf is something we could continue to play well into our old age. This year we pick up tennis as we live nearby so many tennis courts, and they are all free. The rackets aren’t though. We picked up some Wilson which costs some pretty cash. Oh well… I’m keep telling myself, I’m invest in my health. I do need some cardio as too much time on the computer. There are a lot of hobbies out there that are worse investments! When you take into account that you maintain your health, it’s not actually that much money for sports. Your future self will be happy that you’re an avid golfer and now tennis player. Your heart will be in a much better condition as well as your cardiovascular system. That’s why I don’t feel too bad about spending a lot on a new bike in the near future. Mine is getting pretty old now and an update is needed, but you won’t see me skimping there. You must be my brother from another mother, as I too LOVE video games and high-end PCs, haha! I saw in an older post that you said you enjoyed RollerCoaster Tycoon when you were a kid; I personally never played it, but Zoo Tycoon was one of my favorite games back then. I’d spend hours building the ultimate zoo, only to then trap all the visitors and delete all the cage fences so that the animals could devour everyone, hahaha (yes, I’m evil). Haha weenie, I actually much prefer the horde, the only reason I ever went ally was for the OP human racial that allowed dual for trinkets, which could really make a huge difference when pushing for high arena ratings. I guess I’m just….’amazing’! 😀 My friends and colleagues just think I’m a nerd! Pretty beastly set-up, wow! Do you even need that much for World of Warcraft these days? And for Crysis you can never have enough of power, although the latest installment is getting pretty old already. If you’re pushing 144 frames per second you’ll still need the horse power though! Don’t you mind to trade-off a 144hz TN panel versus a 60hz IPS panel? I’m running a i5 4690k and SLI GTX 970 at the moment to run a triple monitor set-up 1920x1080p (and one auxiliary display). Cost me a lot of money, but the experience is plain awesome. And my productivity has tripled because of the added screen estate! The last couple of weeks I’ve been playing a lot of Borderlands 2 again, but my favourite series remains Demon’s Souls and Dark Souls. Too bad I can’t justify a PS4 simply for Bloodborne. And I’m big into racing simulation, so I’m looking forward to Project Cars next month. Haha no you definitely don’t need that much juice to run WoW at max. I just want the satisfaction of playing it with 100+ FPS with everything on ultra, even shadows. And you’re right, Crysis isn’t even the king of benchmarks anymore, I think it’s now Metro: Last Light or something. Seems like you have a pretty sick setup yourself; SLI GTX 970 is probably even more powerful than a single 980 (tho mine is overclocked to the gills). And three monitors…man, that’s the dream! I have 2 and I could never go back to 1, ever. The productivity boost is huge. Can’t imagine how awesome 3 must be!! The last 6-7 years of my life I’ve been pretty much exclusively a PC gamer, especially in the MMO genre. Been playing WoW on and off for nearly 7 years. One of my favorite PC games of all time is Portal. Probably my favorite game ever, actually! This past year I’ve also been playing a ton of Hearthstone, Blizzard’s new online TCG. In college I also played Dota 2 for a while and lots of TF2. Borderlands 2 is definitely a great game, and all the Dark Souls game are awesome. Bloodborne looks sick! Absolutely expensive hobbies, although I’ve mostly learned to keep them in check since Marie quit working and we have to focus more on the ‘frugal’ aspect of saving. I usually spend 30-50 a month on Steam picking up new video games, and although my tastes trend toward indie games (where my $200 video card is more than adequate), it still gets pretty expensive. I’ve since cut that down to about $20, but it’s still calling my name. I’ve found that small splurges, for me, are harder to resist. I’m trying really hard to wait until May 1 to buy Offworld Trading Company on Steam, when it will be in my budget, but I’m having a hard time holding off! Big expenses (new car, etc) are easier to resist since they so very clearly don’t fit in the budget–it’s the little ones where I think, “This won’t break the bank,” that I have a hard time fighting. That’s a pretty hefty chunk each month on Steam games! Do you finish all of your games before going on to the next one? I mostly pick up a lot of stuff during sales, then finish everything before buying new stuff. At the moment I still have a lot of unplayed games in my library. A lot of small splurges do amount to a large pile of cash, so it’s best to keep off them as much as you can. I have the same reflex though: “This is only €5, surely it won’t matter”, but if you count the times I thought that to myself I’d be out of pocket at least €100 every single month. Unfortunately, I almost never finish games. Like you, I tend to bulk-buy them when they’re on sale, but rarely do I finish them 100%. A lot of the time that’s because they’re unfinishable (Mini Metro, FTL, Chaos Reborn, etc.) or crazy-long (the Avadon/Avernum series), but I usually just get bored with them, too. That’s why, now that I’m on a budget, I’m trying to stick firmly to my $20 a month limit! It’s actually helped me get some time in on previously underappreciated gems (Xenonauts, Shadowrun)! I sort of had the same problem, but now that I’m forcing myself to pick up previously bought games I seem to enjoy them more too. And the best part is that I save a ton of money in the process as new games are cheap by the time I get to pick them up. Glad to hear you found a way to make things work balancing frugality and enjoying your hobby! One, I just busted out laughing when I say your never say no to drinks! So true. I also loved how you reframed your computer purchase. I was a little pissed at myself for spending so much on my MAC, but considering how much I use it the cost over time has balanced out. Expensive items like computers should always be viewed over time. One of the first posts I’ve published was on how my €1,600 laptop got me through six years of university, whereas my fellow students were buying a new €600 laptop every other year. Even though I spent a bunch more in the beginning, I came out ahead in the end and enjoyed better equipment. I’m sure the same is true for your Mac! I agree with your outlook on hobbies. The key is not do something that is simply crushing. I spend a lot of time playing sports – I balance it out by reffing so I get to play for free (my cost is equal to what I get paid to ref). For stuff like games I rarely buy, even my FIFA 15 was a Christmas present. One thing is for sure – don’t pass up on those drinks! Just because you are trying to save and be frugal, does not mean you have to be lame. Pretty good idea to be a referee so you can play yourself for free! I remember when I still played football that referees earned a pretty penny for each match, so I can see why you do it this way. And you can make a hobby like gaming as expensive as you like. If you’re content with just FIFA 15, then it won’t break your bank, even if it wasn’t a Christmas present. You made me laugh out loud with your lame comment! 🙂 So true though. What does financial freedom matter if you don’t have friends anymore? The way I see it, you need some hobbies even when you achieve financial independence. If you don’t have any hobbies you might not have anything to do in your free time. True! If you don’t have any hobby related expenses now, you won’t be prepared for them when you inevitabl pick up a hobby during early retirement. Glad to hear we’re on the same page. I’m find myself to be pretty lucky as my main hobby is flying.. And now what is my occupation?Commercial pilot! I’ve turned my hobby from an expense into an income, and thus count myself lucky to have been able to let it all work out like this. Ha, that’s the best hobby to have… One you can turn into a well-paying job! 🙂 And the best thing about your job is that you also get to see a lot and get to go to a lot of places. Overall I’d say that many hobbies increase our level of happiness, but sometimes I wonder if they truly do. A lot of my friends have clothes shopping as their primary hobby (mentioned here in the comments before), but I wonder if that truly makes them happier than if they didn’t buy all those new clothes. Anyway, planning in advance and keeping a balance between splurging and saving is always the way to go! We are all living in the moment, we are only three dimensional beings after all. However, we — the people who are hanging out on personal finance blogs — are planing for those future life moments; making them better. But being a miser is just not worth any future gain, I enjoy my unessential spendings. €3000 in a computer, WOW! Personally, I am rocking a £235 used laptop. I really play games for the gameplay itself and don’t need the latest and greatest graphics(or games), but we are all different and as you said, the enjoyment you get is priceless. My hobbies(not including gaming) consist of walking 2 hours in the morning and longer trips when I feel like it and playing hold’em — playing 50 cents game on poker stars. Poker are not really a big drain on my wallet, then again, I could always play free hold’em games, but the rush I get by fighting over my 50 cents is just so awesome. Living in the moment is a good idea if you’re aware of the future and if you balance things out, but that doesn’t seem to be the case for most people. Luckily most of the people in our commuinty seem to know exactly what they want out of life, how to get it and when to get it, so it’s not too much of a problem. It’s like you said: living like a miser or a hermit isn’t worth it simply to try and save a little bit more. Gameplay definitely trumps graphics or graphical fidelity, but I’m also a really big fan of immersion, which is why I run a triple screen set-up. The added screen estate has also boosted my productivity, which is a nice bonus. 🙂 I’m glad to hear that you have so much fun protecting your 50 cent – I can relate to that as I played cards for a while with buyins of ten cents per game. In the long-run losses and winnings averaged out to zero and I had a lot of fun. Yep, I have expensive hobbies. My gem collections (just spent $400 on platinum crystals), my bonsai, and my carnivorous plants. Yeah, I could be throwing that money at various stocks and getting to FIRE quicker. But just like you, I prioritized my hobbies. These are the ones I love wholeheartedly, and my quality of life would suffer if I didn’t have them in my life. It’s worth the month or two extra I’m going to have to work just to ensure my happiness. No point in having a heck of a lot of money if you have nothing else to interest you. And in all honesty, if nothing interests you, you’re probably uninteresting. The way I view it, as long as our savings rate isn’t halved because we need the money to pay for our hobbies or whatever, then we should be entitled to our expensive enjoyments! Great mindset, buddy. Saving and investing as much as possible is important if you wish to become financially independent, but hobbies are just as important. If you FIRE without ever picking up a hobby, you probably won’t have the funds to start them during retirement, which defeats the entire point of FI in my book. Happy to hear you make sure to enjoy yourself from time to time! While investing is a huge hobby of mine, I do like to spend my time at the gym but that costs me 30 dollars a month. I am thinking about investing in my own bench press (possibly building my own) and that would allow me to cut 360 dollars a year! But, like you mentioned, I prioritized my hobbies because they are what they are, hobbies! I need them in my life. I would go insane without them, because then my whole life would be school and work! Awesome post, can’t wait to read more! Enjoy your hobbies! You seem to have figured out a great work-life balance. My favorite times are doing things that are free. Hanging with my friends at their house doing some BBQ and drinking beer. Playing horseshoes or sitting around talking is fun for us. Our kids are that way to. We went on a beach vacation last year and then visited my brother for 2 days after that on our way back home. When we asked the kids what was their favorite part they said playing with their cousins. Enjoyable human interaction seems to be the key to happiness. Not buying things. I’m glad to hear that you value family time and basic human interaction above everything else. Good times with friends and family is something that you’ll never forget, whereas I can’t even remember all the stuff I bought last year. The fact that your kids already share the exact same views says a lot about you and your household. Very interesting graphs. I should do the same for my expenses. I think one thing would further improve it: not scaling it to 100%, but instead use the absolute numbers. Thank you. 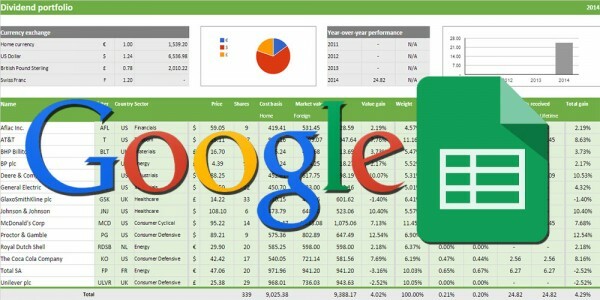 Be sure to let me know what you gathered from your own data and graphs! I used 100% scaling because the savings rate principle is based on the average savings rate each month. Using absolute numbers would skew things too much in months with high income/low expenses or low income/high expenses.